Here are few lines about my Twinspiration story. The adventure begins about 2 years ago when I started to become frustrated because I had to stop my deep dives because of bailout considerations. I had one machine on my back that allowed me to stay 4 hours down and my bailouts divided that time at least by two and reduced my maximum depth to about 120m. Because I did not want to bring with me more than two sling tanks, the only solution was to have a second CCR as bailout. - The bailout CCR will have to be full automatic (automatically inflated and deflated). 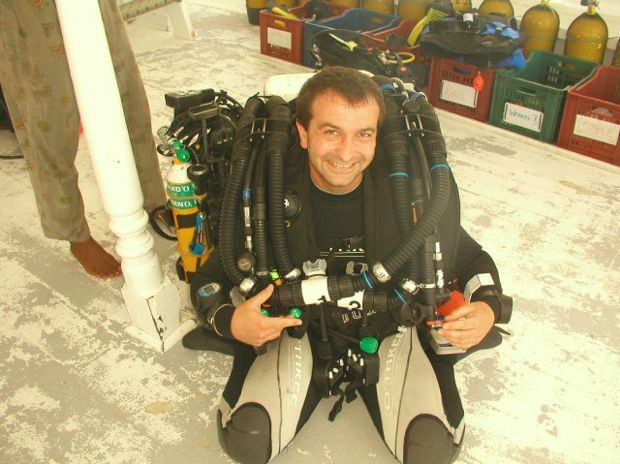 - The automatic inflating device of the bailout CCR could be stopped at any time by the diver. - All the tanks should be used by both CCR (swapping O2 admission for one CCR to the other and swapping diluent admission for one CCR to the other). - Changing of diluent (ie: tmx to air) will have to be possible on both CCRs. - Emergency procedures (closing O2 tank, purge...) will have to be done easily as for a single Inspiration. - Both CCR of the Twinspiration should be used at the same time (no interferences between the CCRs). 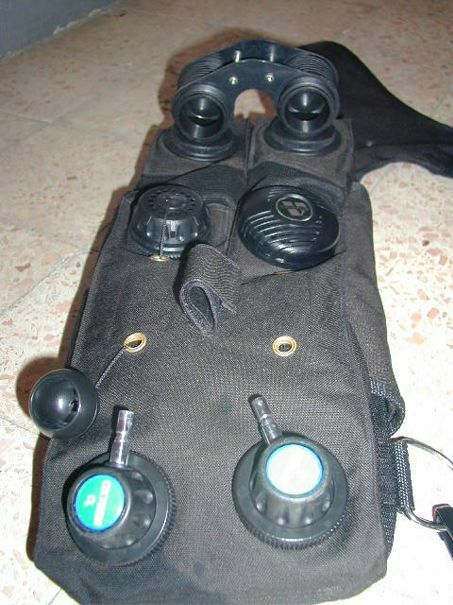 - The diver will not need any help to be equipped or unequipped. Due to economical and maintenance reasons an important point was also that the Twinspiration will have to made with standard parts. The Twin-counterlung: According to those specifications, I decided to create a specific twin-counterlung. That was the only solution I saw. The counterlungs should be side by side to prevent any interference between them and to be easily deployed. At that time, gas swapping or diluent changing procedures were solved. More, that way gave to me the solution of another problem: weights. Due to the second breathing loop the machine will be too much positive. 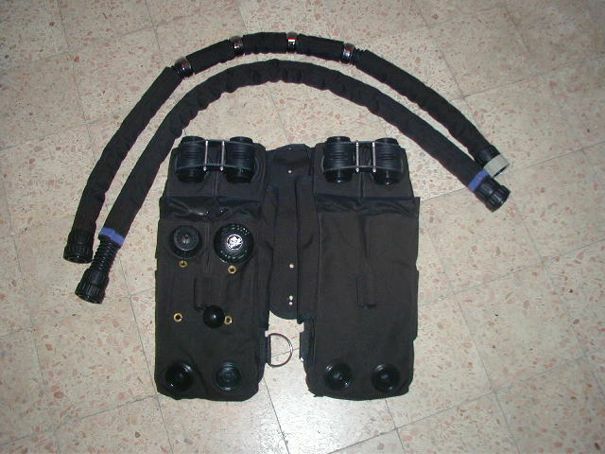 Although I reduced the width of the original single lung to be able to put two lungs side by side, the width was still big enough to add weight pockets on the counterlungs. 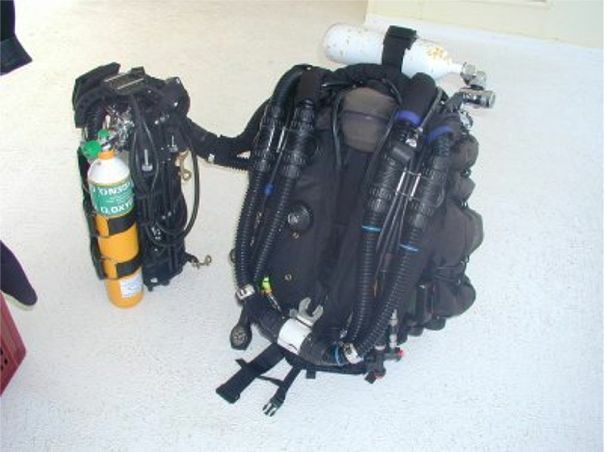 The space between the two T pieces was big enough to channel the BCD hose and at least five standard hoses. The automatic inflator: I decided to create the automatic inflator around an Apeks TX40 second stage for the good reason that most of my regulators are some. Its location at the place of the Inspiration manual inflator was imposed by the fact that I wanted to be able to swap diluent admissions. I mechanically strengthened the original Apeks membrane due to the air column generated by the length of the lung, added a free flow control device to stop the diluent flow if needed and machined an adaptor to connect the original Inspiration manual inflator quick connector to a standard inlet of second stage. The automatic inflator is connected to the counterlung as a standard manual inflator. 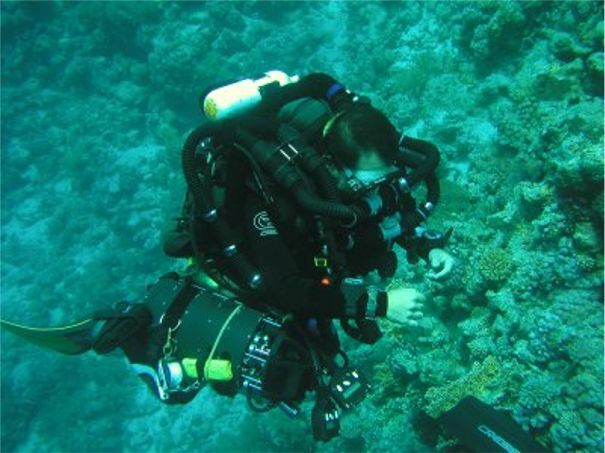 In this way if any problem occurs with it before a dive, it can be replaced easily by a manual inflator�or by another automatic inflator! After tests it appeared quickly that to adjust the flow of diluent, a TX40 was not enough, that is the reason why I added the missing parts of a TX50. The automatic deflating device: The automatic deflating device was made by changing the manual over pressure valve of the lung by a dump valve. For what I heard after some other Inspiration�s divers already did it with success. The tanks holder: The side mounting choice of my second Inspiration was decided by two facts. Firstly I did not want to change so much my original Inspiration. Secondly I was sure to not need every day a Twinspiration and I did not want to have two machines to carry, one Inspiration and one Twinspiration. 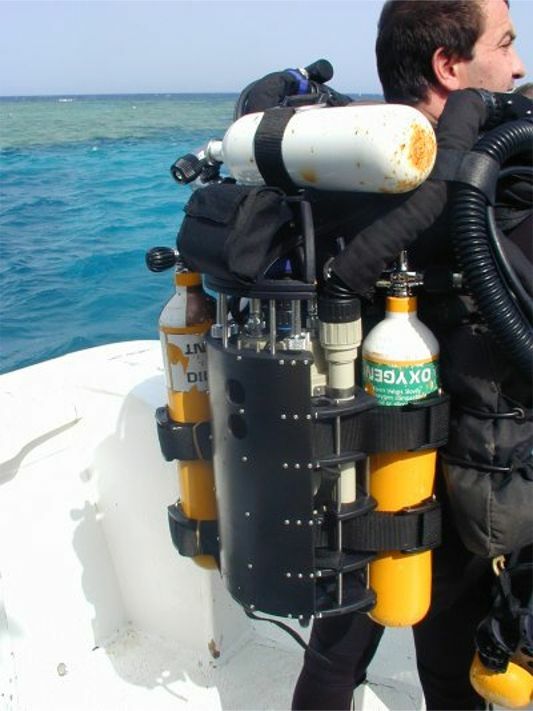 So I planed only to add outboard tanks to my Inspiration, as many Inspiration�s divers do, and to carry the second unit as a sling tank protected by a �quick made� case. After a while, I realized that few elements were missing to have a complete second Inspiration. I would like to built a housing for my side mounted Inspiration with a double function. I modified my plans to be able to use the case as a tank holder on my back. 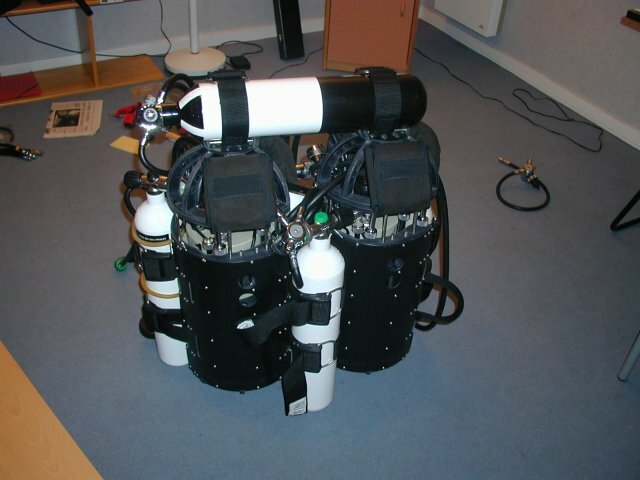 For the fun I decided to create a tank holder than could support up to five tanks, including two height liters tanks for the diluent and one 6 liters for the BCD and the dry suit. By that way I will have a Twinspiration that should be able to go up to -200m as safe as it could be. According to that last modification I was on the way to have two complete Inspirations, that fit together, thanks to a small kit, should make a Twinspiration. I completed my drawings to have a tank holder where a tek diver could fix all he wanted. Finally a place was reserved for advertising, logos or whatever. Another good point to create a tank holder was to try to reduce the weight of a single unit when traveling. 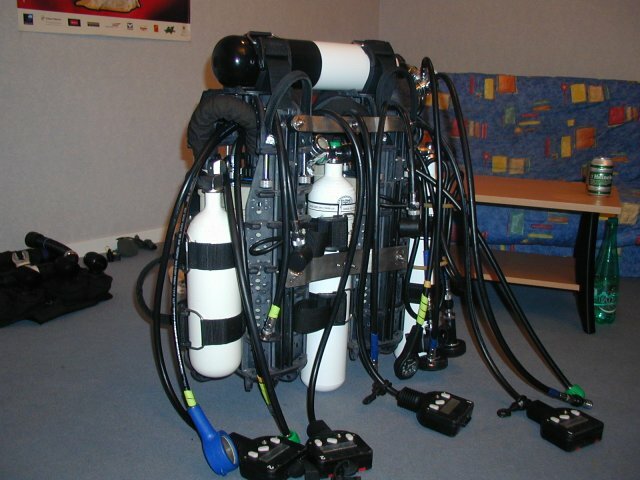 Thanks to that tank holder, I can fix now most of the dive tank I find in diving centers. The removable second stage: What about second stages? Even with a Twinspiration I saw cases when taking few breath from a second stage could be useful, especially at depth. That is the reason why I still have second stages connected to my diluent tanks. 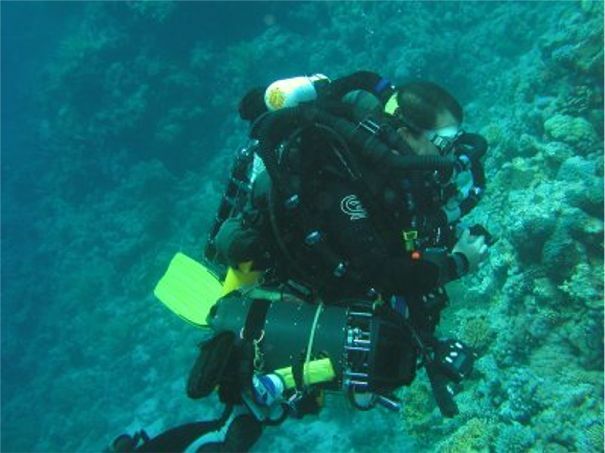 There are located both on my back and don�t disturb me at all during the dive. 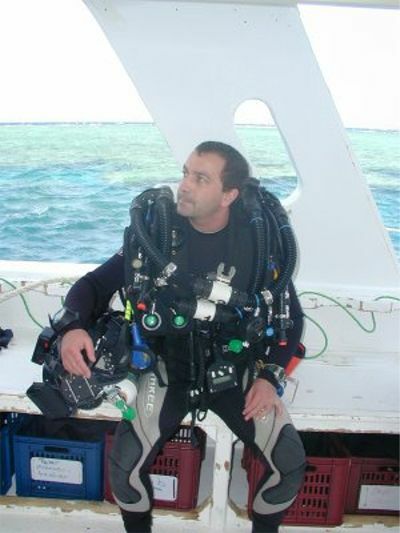 One of my pleasures is to finish the last 6m of a deep dive on open circuit on oxygen. Because of full redundancy considerations (I am a bit paranoiac), I would like to be able to breathe oxygen from both tanks but I did not want to have a big amount of second stages. That is the reason why I made a removable second stage. 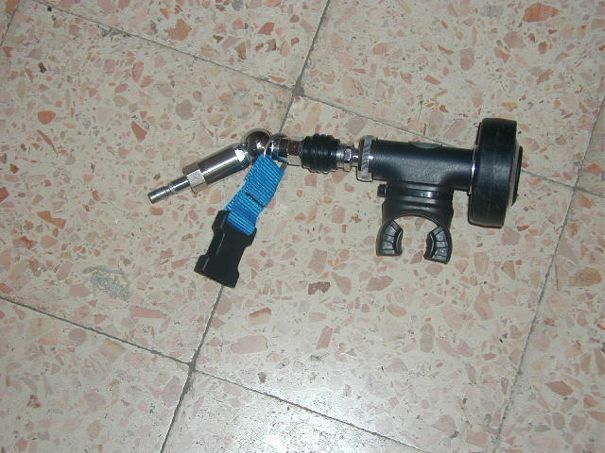 I used the same kind of adaptor I used for my automatic inflator, connected a 360 degrees flexible elbow for practical reasons and a free flow control device to prevent loss of oxygen and it was done. Results in the water: First job was to code everything to be able to know which equipement was connecting to which. 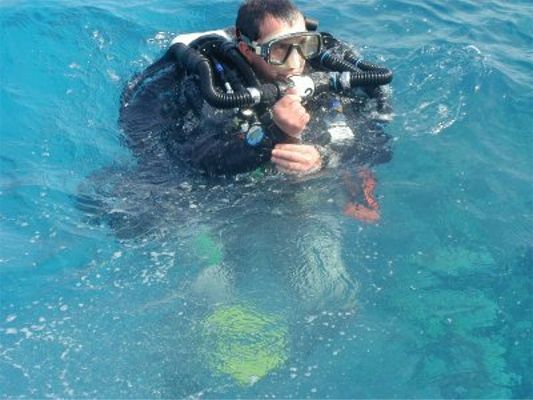 Diving with two Inspirations is not exactly the same as diving with one. Many shallow dives have been made to define new procedures. As example, both loops cannot run with the same PPO2 set point during the dive. When the procedures are assimilated and if there is no need to go to the bailout loop then you really think that you have only one single Inspiration on your back. Thanks to my Twinspiration I was able to go deeper, and in my point of view safer. I was also able to dive on heliox, one thing that I have been dreaming from a long time. About the future: The only thing I would like to make now to finalize my project is a small kit in order to carry both Inspirations on my back. I do not think it will be complicated to do but I am a bit afraid about the huge back pack it will make. The actual side mounting allows me penetrations by putting the sling unit in front of me. I will have also to make few modifications because that Twinspiration is a first try and everything is not 100% perfect�but fortunately almost! 2004 UPDATE. Philip sent me his last modifications. Thanks Philippe. I wish you best luck, and strength! What a long time we have spoke! I hope that everything is going OK for you. I hereby sent you the latest Twinspiration improvement. As I said a couple of year ago, my plan was to create a kit to fix both CCR�s on my back, so here it is. 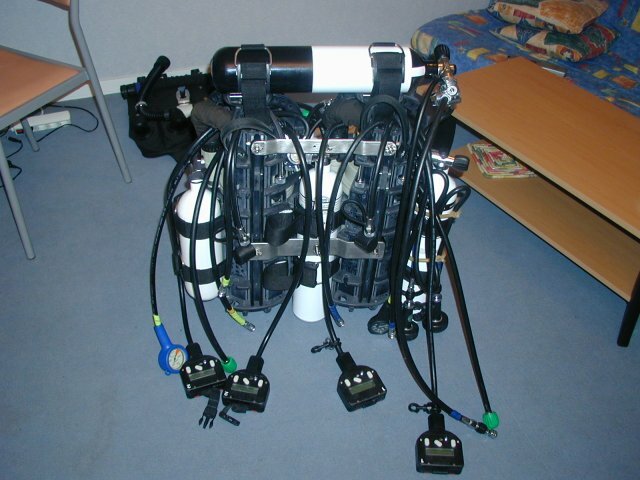 Unfortunately I�m not able to send to you underwater photos with the final version of that Twin yet. Anyway, my last version is only a bit �cleaner� but it looks like the one on the photos. The swimming pool tests gave really good results. Stability and buoyancy is OK. To compare the single setting and the twin one, I put also 2 photos of my Inspiration in the single configuration. And what about you? 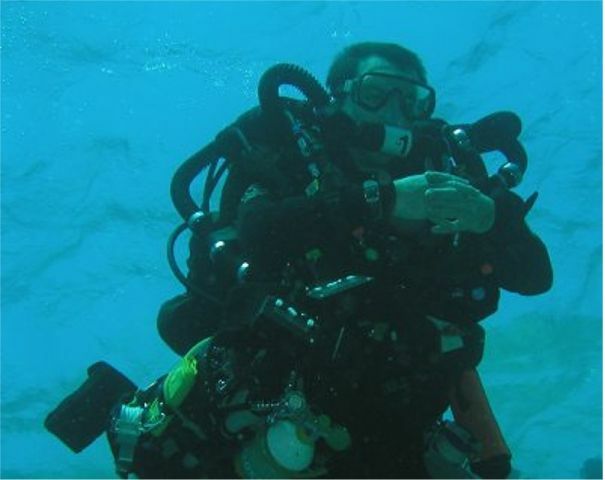 Did you enjoy your Trimix dives in France last year.